The joystick doesn't work if you change the deadzone setting after starting DOSBox. It does work if you set the deadzone setting in the .conf file, however. This affects both the ECE and vanilla versions. Ah, forgot to mark something as changeable. Aaaaaand... it's updated! r4076 is up! How can i get rid of these black bars on top and bottom? vorob wrote: How can i get rid of these black bars on top and bottom? Are you using "surfacepp" as output? If so, you won't get those removed. If not, please post the content of your .conf file. Please, tell me what I should use to get rid of them. Cause it looks strange. Okay, this output=surfacenp solved my issue, but fps in quake 1 is horrible, why? In output=opengl fps is okay. 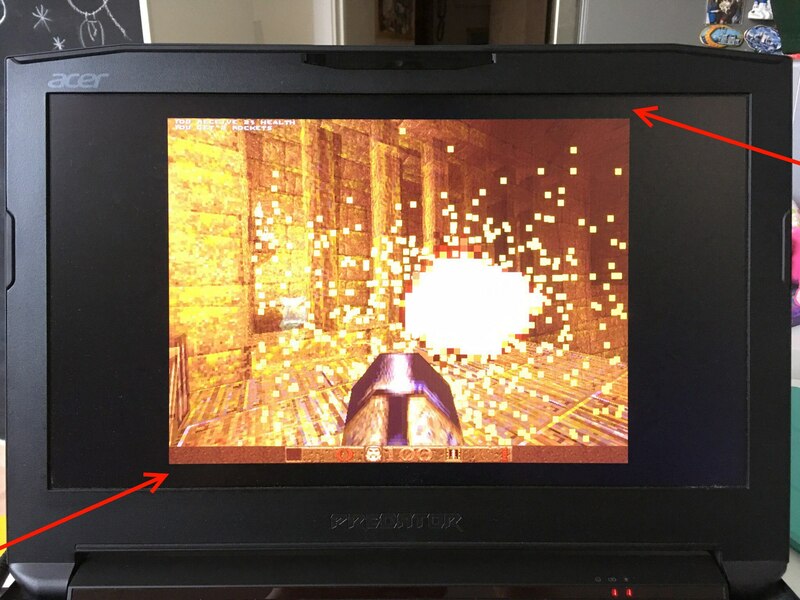 vorob wrote: Okay, this output=surfacenp solved my issue, but fps in quake 1 is horrible, why? Surfacepp and surfacenp both have higher hardware requirements than opengl or openglnb, that's why it runs worse with more deamnding games like Quake. windowresolution=640x480 <--- This is important, else the window will be HUGE since the scaler set to 'forced'. 40,000 cycles is somewhere around Pentium 133. Use cycle up/down to adjust for newer games that use higher resolutions than 320x200, or older games that don't boot or have sound issues. I find that 40,000 is the sweet spot for most DOS games. Looks like there might be an issue with DOSBox ECE 4085 and Descent 2. DOSBox EXE 4085 hangs up when the intro video tries to play. I've tested various versions of DOSBox ECE back through version 4007 and all of them seem to hang on the video playback. Descent 2 is working fine with both DOSBox .74 and the plain DOSBox SVN 4085 versions. jonney5 wrote: Looks like there might be an issue with DOSBox ECE 4085 and Descent 2. DOSBox EXE 4085 hangs up when the intro video tries to play. I've tested various versions of DOSBox ECE back through version 4007 and all of them seem to hang on the video playback. Descent 2 is working fine with both DOSBox .74 and the plain DOSBox SVN 4085 versions. No issue here, at least with the version from GOG. It runs just fine with output=overlay and output=openglnb (didn't try the other options). Dungeon Keeper seems to lack aspect correction when loading a map with surfacepp. The loading screen and in-game appear fat. Durandall wrote: Dungeon Keeper seems to lack aspect correction when loading a map with surfacepp. That's exactly how it is supposed to be. The intro, loading screen and the game are natively rendered in 320x200, which is a 16:10 widescreen resolution, the menu and the map selection instead is rendered in 640x480 natively, which is a regular 4:3 resolution. Since surfacepp scales the image keeping it's correct aspect ratio, you get a wider (fat, as you called it) image when the widescreen resolutions are used and a tighter image whenever 4:3 is used. I finally figured out what my issue was. The ECE version hangs up on the video playback if the PC speaker option is disabled. Thanks for helping me figure out what was going on. Yesterplay80 wrote: That's exactly how it is supposed to be. The intro, loading screen and the game are natively rendered in 320x200, which is a 16:10 widescreen resolution, the menu and the map selection instead is rendered in 640x480 natively, which is a regular 4:3 resolution. Since surfacepp scales the image keeping it's correct aspect ratio, you get a wider (fat, as you called it) image when the widescreen resolutions are used and a tighter image whenever 4:3 is used. Just did that. As I suspected, this just doubles the resolution from 320x200 to 640x400, which is still 16:10.
jonney5 wrote: I finally figured out what my issue was. The ECE version hangs up on the video playback if the PC speaker option is disabled. I just tried it myself and the exact same thing happened. This error comes from the patch that makes the emulated pc speaker sound more like a real one. I mentioned it in the corresponding thread and hope that it will get a fix. Yesterplay80 wrote: Just did that. As I suspected, this just doubles the resolution from 320x200 to 640x400, which is still 16:10. Thanks for checking it out. I suppose I've gotten used to incorrect aspect via manual config . I love being able to fullscreen with surfacepp, no distractions. A little more info would be useful. Which game causes the error? How did you configure the DOSBox settings?